During the height of his popularity, Hemanta Kumar had a huge following in Bengal and as a result several new singers with voices closely resembling 'Hemanta' became quite popular. Many thought that Subir sounded a bit like Hemanta, but really speaking he had his own quality which can't be denied. The only problem was that his range was rather limited. This in turn limited the type of song he could sing. In spite of that he did record some wonderful songs and Salil also wrote some beautiful songs for him. In fact one of the songs 'Dharonir pathey pathey' must be one of the most beautiful songs Salil has ever composed and it was Salil's one of the most favourite songs. Later on Lata re-recorded it as well but never came close to Subir's version. Subir later re-recorded (in '80s) 'Odhikaar key kaake dei' and also 'Jaani na jaani na' in a CMR recording, along with the songs from nr 5 to 11. CMR was Salil's own recording company and long since defunct. Song no. 3,4,6,7 and 8 are not available anywhere else. In the original recording of 'Odhikaar' on the 45 rpm there's a narration of the song by Salil himself, before Subir starts. It's great ! 'Pagol hawaa' was originally recorded by Jatileshwar Mukhopadhyaay in the '60s and 'Jaani na jaani na' was originally recorded by Sachin Gupta also around the same time. I would vote for the originals. In the early nineties Salil composed a completely new melody for the song "Kono bhaalo kobitaar duti ponkti daao" for Antara. When I asked him why he did that, his reply was that he wanted Antara to sing that song but he couln't remember his original melody ! Somehow I never believed that. Strangely enough I like both the melodies. An interesting fact about Subir Sen. He composed the music for a film called 'Midnight' produced and released in England in the '70s. Rafi, Geeta Dutt,Asha and Subir himself sang some songs. For collectors, there's an LP and even a CD out. Song#SS7 was later recorded by Antara Chowdhury and Salil changed the melody completely. When asked, he replied that he just couldn't remember the original melody, so he just created a new melody for the same lyrics. 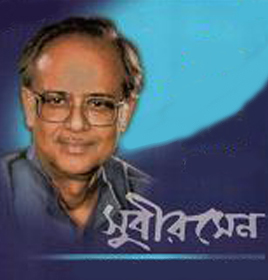 Saikat Mitra later sang the Hindi version (lyrics: Yogesh) of this song in a Doordarshan program. Song#SS2 has been rerecorded by Sibaji Chattyopadhaay(#AS14) in 1990 with extended lyrics by Salil. The original version of Song#SS5 by Sachin Gupta(#OS15)recorded in 1978 and is far superior. Same goes for Song#SS10. The original version recorded by Jatileshwar Mukhopadhaay(#OS18) in 1978 is much better. The most memorable song by Subir must be #SS1. It's also one of the most beautiful compositions of Salil. I remember Salil once remarked that 'Dharoniro pathey pathey' is one of his best compositions and he considered Subir Sen has done a brilliant job.